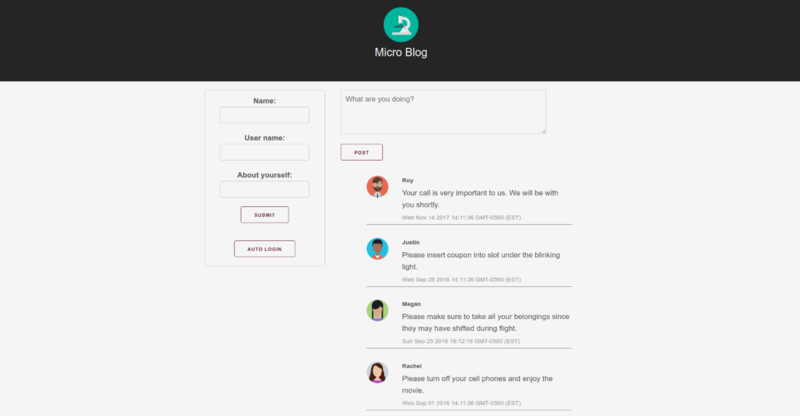 Micro-blog simulator made with ReactJS. Makes use of components and state. Includes a log-in form, an entry form for blog posts, and a list of posts in reverse chronological order. A Greeting.js component, that displays a Login.js component if the user is not logged in, or the Profile.js component if our user is logged in. A Post.js component which lists the posts in reverse chronological order. State is concentrated in the main App.js, and then passed down to the other components via props. The isLoggedIn boolean instruct the Greeting.js component what to display via a conditional rendering: if false, display a log in form (Login.js). If true, display the current user's profile (Profile.js). Once logged in, users can write posts and they will immediately appear as the first post of the list. Finally, there is a second log in button called “Auto LogIn". Once pressed, the app gets the profile info of a default user that is hard coded in a users.js file so that you won't have to type anything. This is useful when you plan to come back to the app often and want to load your info quickly (sort of an express log in).